Matt & Dan had always dreamed of owning a Bed & Breakfast, in a quintessential New England town. Believing that this would only remain a dream, they continued to play it safe by working in steady jobs, comfortable knowing a steady income would continue to pay the bills. Then, in January 2016, the company Matt worked for was bought over by an international firm and he learned his IT job would be eliminated in mid 2017. After spending 23 years of managing stores in a big box book retail chain, Dan was tired of working for larger companies where his input and visions were limited. Knowing a big change was coming their way, they enrolled in an extensive inn keeping seminar to learn how they could begin to turn their dream into a reality. After completing the seminar, it was clear that this was the path they wanted to pursue. After traveling up and down the East Coast, from North Carolina to New Hampshire, they fell in love with Maine, the Mid-Atlantic coast specifically. Windward House was one of the inns they had visited early in their travels, and every other property they visited was compared to Camden and Windward House. In late summer 2017, with Matt’s job coming to an end, Dan resigned from his job at Barnes & Noble Booksellers. With a leap of faith and all stars aligned, they sold their house in Central New Jersey, packed up their cars, and headed North with Barney, their loyal chocolate lab mix. 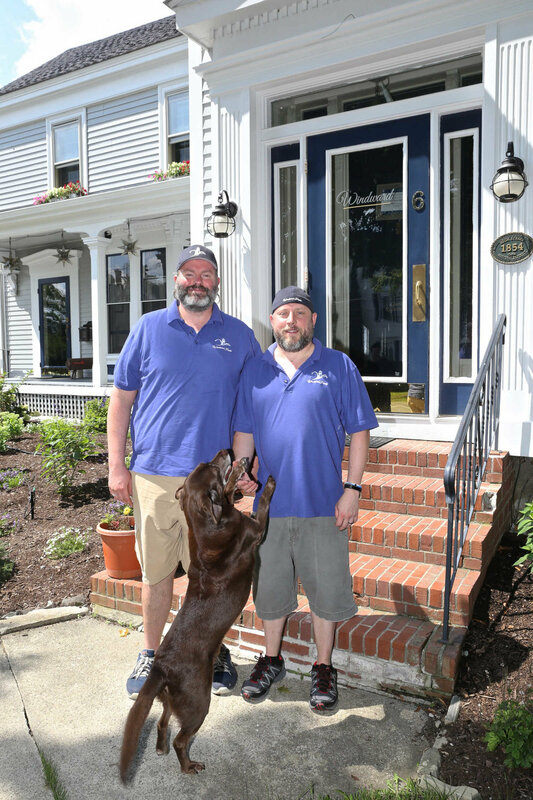 Matt & Dan look forward to welcoming you into their beautiful 1854 Greek revival home in the SoHi District of Camden, Maine, in the heart of it, from the heart of it!! !